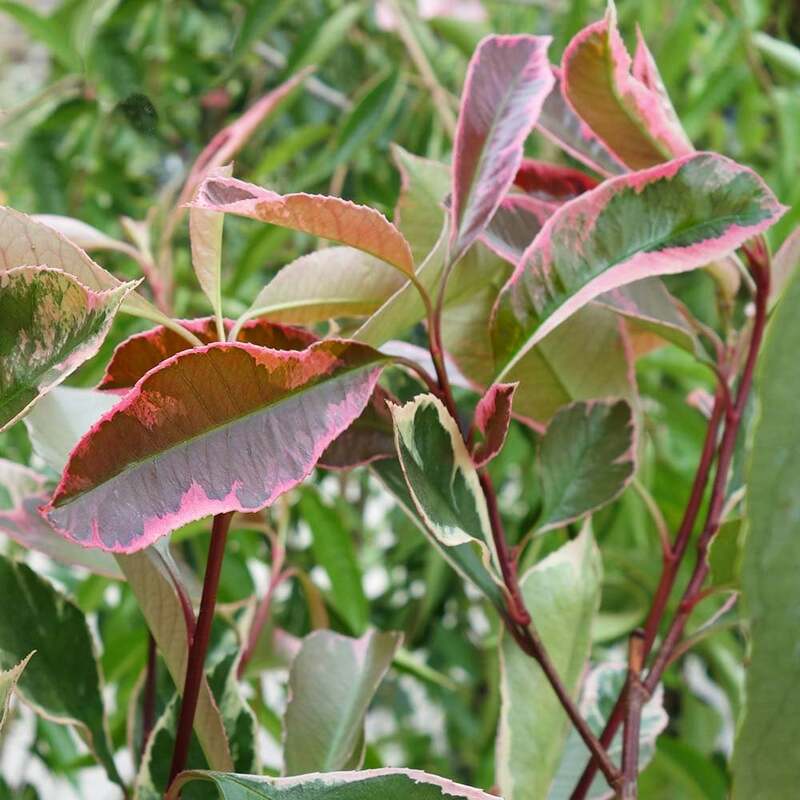 An exciting new cultivar of variegated evergreen Photinia, ‘Louise’ produces two to three flushes of bright pink new shoots each year. These mature to attractive variegated leaves made up of green, cream and pink hues, ensuring there is always something to draw your interest. Photinia x fraseri ‘Louise’ grows to just 2 x 2 metres in 20 years, making it a perfectly proportioned little tree for small gardens, patio pots and front gardens requiring year-round interest. Its neat and dense habit means in requires minimal pruning to keep it looking its best and it would be ideal for evergreen screening. It really is a fantastic eye-catching all-rounder. Our pot grown Variegated Photinia trees can be planted at any time of year. Remove weeds and grass within a metre of the planting position, then dig a square hole as deep as the root mass and about twice as wide. We recommend sprinkling root grow in the hole to help the tree establish. Remove the pot from the tree, gently loosen the roots and place into the planting hole. Mix 50% of the original soil with 50% compost. Use this to fill in the hole and firm around gently, taking care not to bank soil up around the collar of the tree. Use a stake and tie kit to anchor the roots - further info is in the planting guide. When planting Photinia in spring or summer, water well and regularly for the first few months. Increase watering if there are extended periods of hot or dry weather. You can use an irrigation kit to help. When planting in autumn, you may only need to water a little. Keep the area free of competing weeds and grass for the first few growing seasons - mulch matting will help. If needed, use a rabbit guard. Pruning Variegated Photinia encourages the bright pink new growth.